As a man who pursues his wife, desiring to love her well and support her in the things she is passionate about, it was easy to follow her to Angola, Africa to witness Hope For Our Sisters’ support for women with a fistula. Had I ever been to Africa? No. Know much about fistula? Nope. Did I think it’d be a little awkward being the only non-medical dude on a trip surrounded by women who are suffering from a birthing injury? Yup. And as the dutiful adventure-seeking husband that I am, I went, and opened my eyes and my heart. Fistula is a family issue, not merely a women’s issue. This I am 100% convinced is true. Almost all of the women we met at the hospital (CEML) were abandoned by their husbands, and in many cases their families. Why? Ever try living in a public men’s bathroom? I doubt it. You know it always stinks with urine and filth. It’s not pleasant, yet these women live with that stench around them constantly because of their injury. Did they choose this? No. Who would? Yet they are often treated as if they deserve this and need to be punished. The system and breakdown of the family has failed them, and so they suffer alone. 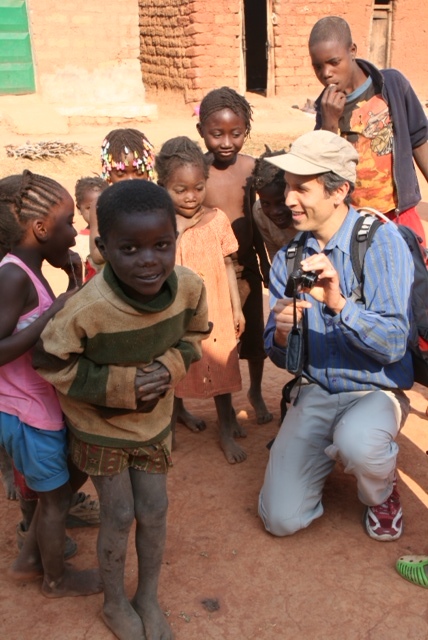 LEFT: Paul amazing the kids in Kalukembe with his digital camera. RIGHT: Rosa, one of our sisters at the Kalukembe hospital. She is now dry!